Want jaw-dropping yields and intensive plant growth? 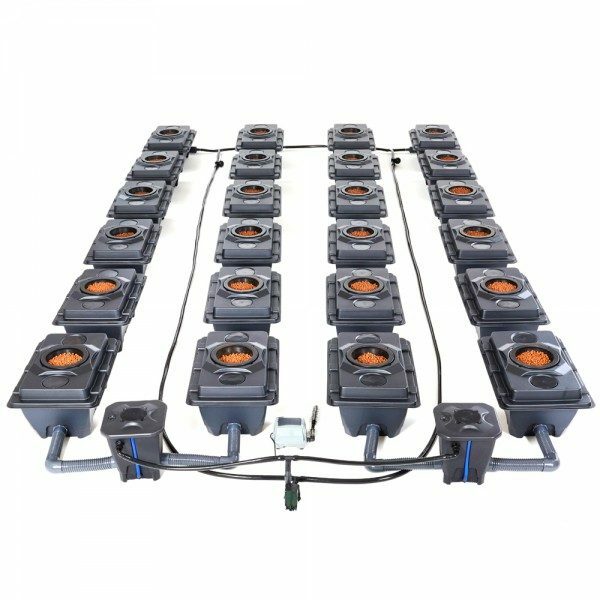 Get ready to marvel at our Rush DWC systems! It’s the Rolls Royce of all bubblers. Up to 34 full circulations every hour! It’s the best bubbler system you can buy. Plants are placed in mesh pots filled with clay pebbles. Bare roots grow out of the pot and into an oxygen & nutrient rich solution. Feed is whipped around your system at a super high speed (34 circulations an hour)!! It never stagnates! All that mixing traps oxygen, while keeping your CF, pH & temperature stable and uniform in every pot. The feed whips around at such high speed for maximum oxygen, leading to explosive rooting, growth & nutrient uptake! Allows for rapid recirculations & prevents blockages! To support dense, heavy plants and monstrous roots! 62 x blanking caps are included so you can add pots without draining your system. ! Hardly any media is needed (just 6.5 litres of clay pebbles per pot) and there are no timed feeds ( systems run 24/7). You can quickly see inside each pot via access holes. To drive root growth and prevent root diseases at bay, oxygen levels are crazy. There’s no media to restrict rooting either. Plants get unrestricted access to nutrients and oxygen to speed up uptake. The sheer size of roots is enough to smash uptake alone! 40L Pots (62cm Pot Centres).